Happy Hump Day Crafty Friends!! Oh my gosh... It's only about 2-1/2 weeks till Christmas!! Where is the time going?? 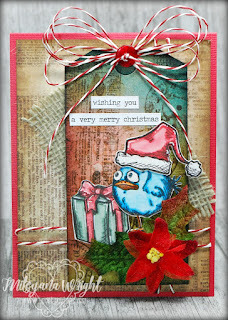 Today, I have a Christmas card that was inspired by Tim Holtz's 12 tags of Christmas series. 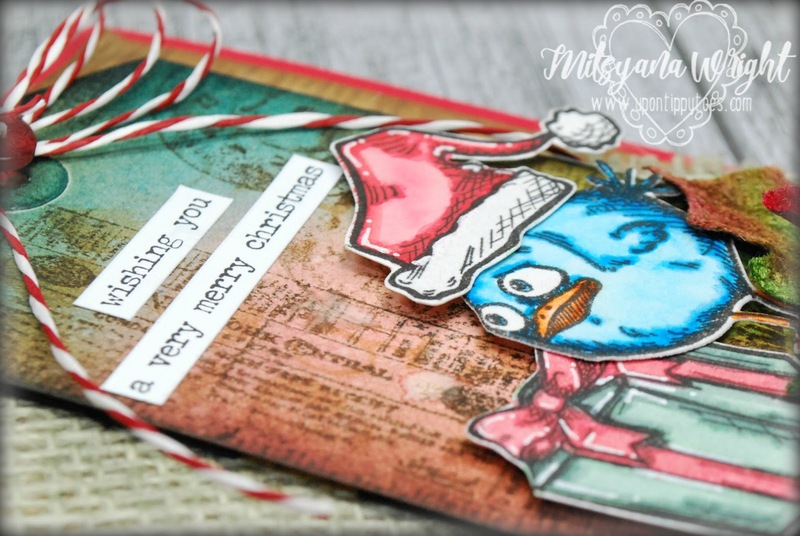 I just love his tags and I was so over the moon excited when I heard Team Xyron would be collaborating with him... Eeeeek!! How exciting!! I've always wanted to make a T.H. tag... I'm so glad I finally took the dive and made one!! 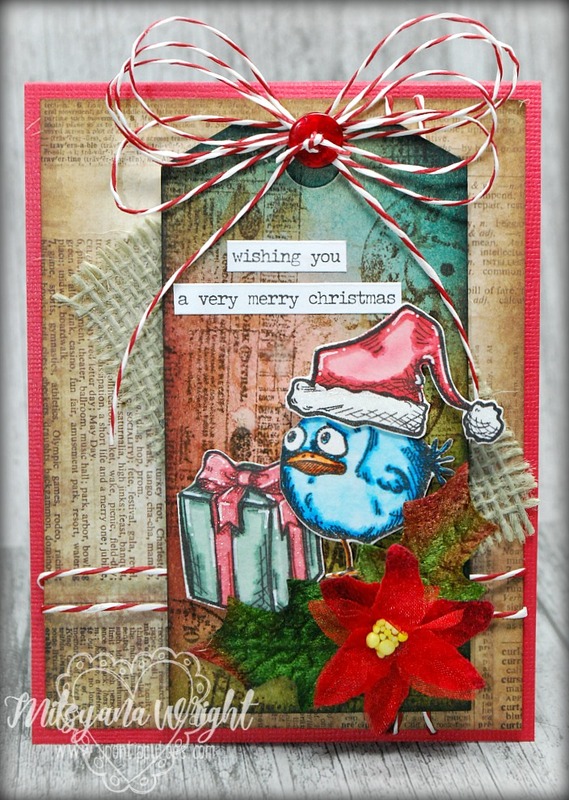 I started by stamping my image, from the Bird Talk stamp set by Sizzix, with an archival black ink. 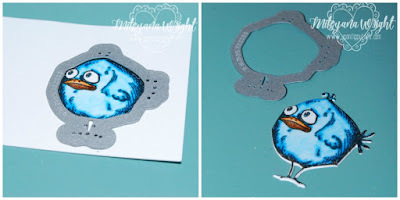 Then traced around my image using Tim Holtz Distress Markers in Mermaid Lagoon (for the body) and Carved Pumpkin (for the beak). I then used a waterbrush to blend out the colors. 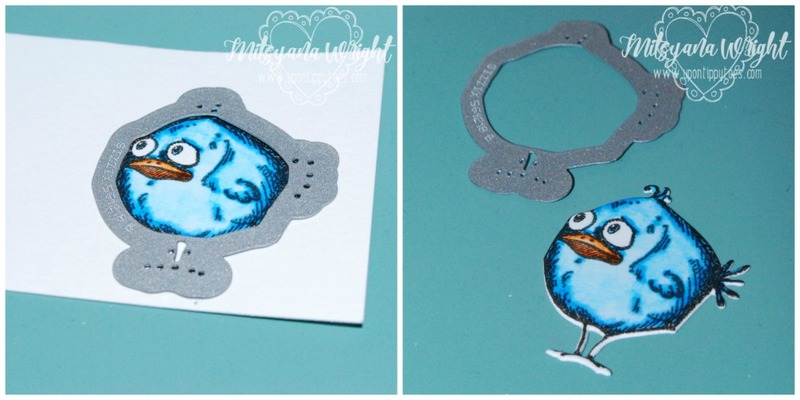 I used the coordinating dies to die-cut out the little bird. (these were included in this set). I don't have many marker colors, so I improvised by using Distress Stains. I dabbed some color onto an acrylic block to use it as my palette. I used Bundled Sage (for majority of the gift) and Abandoned Coral (for the bow). I also used the Abandoned Coral for the Santa hat. Then with a water brush I picked up some color and traced around the areas I wanted to color. Then with more water blended that color out. I didn't have the matching dies for this stamp set so I just fussy cut out both images. 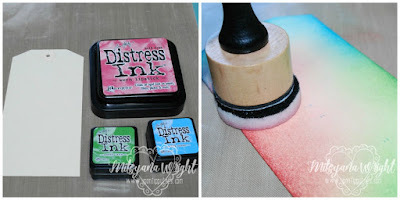 With a manilla tag, I used a mini blending tool and Distress Inks in Worn Lipstick, Mowed Lawn, and Salty Ocean to create a multicolored background. Using Tea Dye Distress Ink, I stenciled alphabets randomly onto my tag. 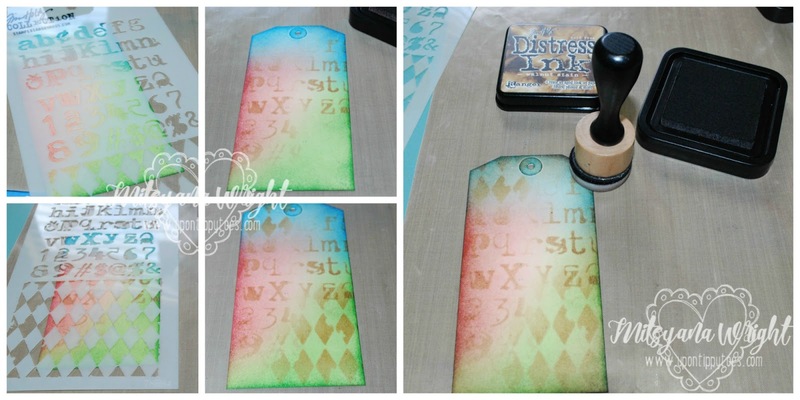 Then, I used Vintage Photo and stenciled the harlequin design. I, then, inked all around the edges of the tag with Walnut Stain. 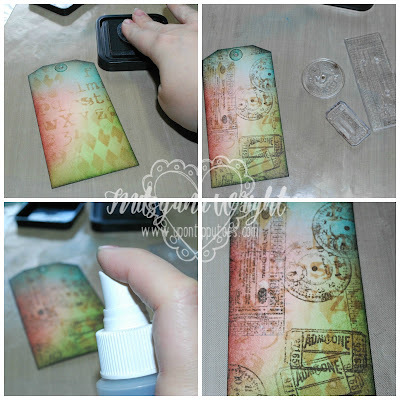 Using more walnut stain, I used the ticket, clock, and conductors receipt to add another layer to my background. Then gave it a quick spritz of water. This part is totally optional. I just like the lightly splattered look onto my background. 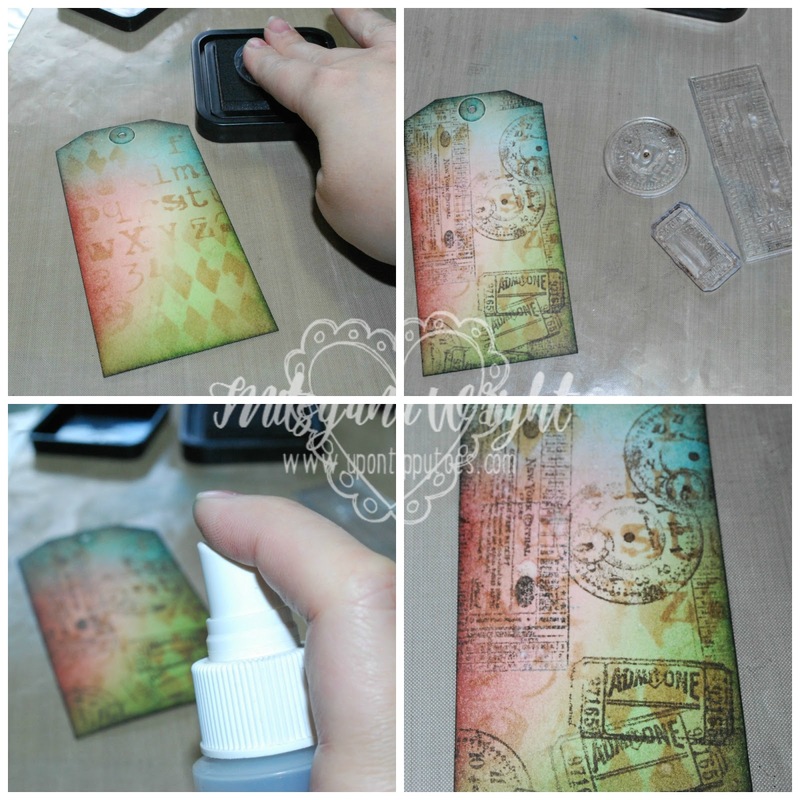 To add all the elements to my card and give it added dimension, I made my own foam adhesive. I cut a 2"x 4" piece f craft foam and ran it through my 3" Sticker maker. Then trimmed it, flipped it over, and ran it through again. 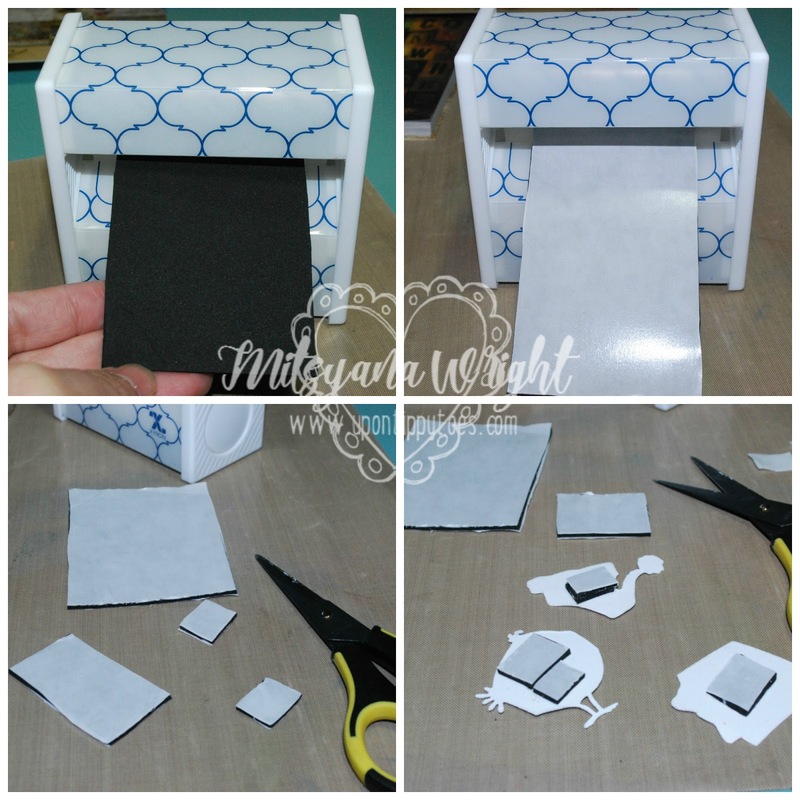 Then, cut it down to the sizes I needed (making sure to keep the protective backings on while cutting). I added foam to the back sides of the bird, gift, and Santa hat... as well as the back of my poinsettia. I also used my 3" Sticker Maker to add adhesive to the backs of holly leaves. And attached them onto my tag. Then added my colored images and flower. 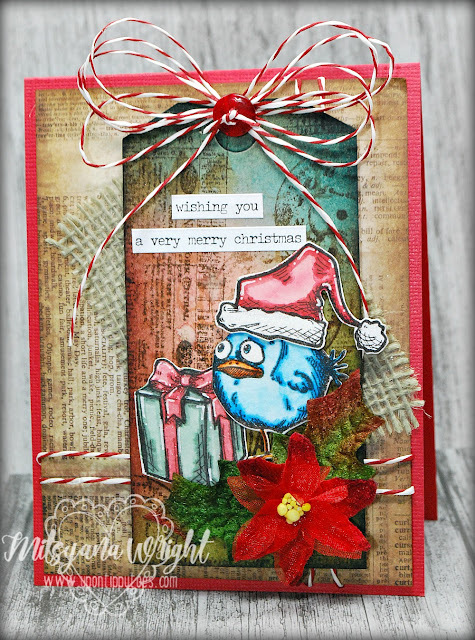 I used the "wishing you a very merry christmas" sentiment from the Small Talk Occasions book and trimmed it down to fit onto my tag. I just love this book!! There are terrific sentiments for every occasion in here!! I topped my tag off by adding a multi-looped bow made of red and white paper string. I absolute am nuts over this stuff!! I really think this stuff is better than twine! It doesn't fray and because of it's stiffness it's easy to thread through holes!! This is some really awesome stuff! I found this newspaper/ book Tim Holtz print paper and trimmed it down to 4"x 5.25" and inked the edges with Brushed Corduroy Distress Ink. Then, used my Xyron Mega Runner to add adhesive to the back. Next, I added more paper string. Wrapped a couple times horizontally and vertically and tucked the ends around back. For even more layers and to add texture, I ran a 2"x3" piece of burlap through my Sticker Maker. Peeled it and adhered it to my card mat, which I also attached to a 4-1/4"x 5.5" (A2 ) sized card. Lastly, with the leftover foam adhesive i made earlier, I attached it to the back of my tag and adhered it to my card front. Here's "wishing you a very merry christmas"! !